A horse’s diet definitely influences his chances of staying sound. And, as in most things to do with horses, the answer to a healthy horse is a delicate balance between performance, condition and soundness. One major way we can easily influence all three of these variables is by feeding for soundness. Young horses often develop a bone and joint disorder called DOD (Developmental Orthopaedic Disease). This is caused by feeding too many calories, inadequate or unbalanced minerals or an unsteady growth rate. To overcome this problem, one needs to feed a properly balanced diet, using a high quality feed, for the first two years. Feed for a moderate rate of growth (0.5 to 0.8 kg per day for an average yearling) and moderate condition, instead of rushing growth or overloading the bones with an overweight body. Breeders who are more concerned with feeding youngsters up to get a large fat horse for the sales or show ring will cause problems for that horse in the future. Once the horse is fully grown and in work, the horse owner needs to put a lot of thought into balancing performance and condition against a sane mind. An overfed horse will not be a safe or sane horse and will be more prone to injury, both in work and in the paddock. Also, an overweight horse puts unnecessary strain on his joints, hastening their deterioration. On the other hand, an underfed horse could become fatigued when working and also risk injury. When deciding on a diet the horse’s temperament, metabolism, time spent stabled and level of work all need to be taken into account. Perhaps the most important aspect of the horse’s diet is hay or grazing and this must make up the bulk of his daily food. The equine digestive system digests fibre (aka structural carbohydrates) from grass in the hindgut, with the help of microbes, forming an energy source called Volatile Fatty Acids (VFAs). This is what your horse’s digestive system is designed to do and it is imperative that the bulk of his food is grass or hay. Ad lib grazing or hay is recommended. Nonstructural carbohydrates (NSCs) are a different matter and can cause soundness issues. Hay or grass which is high in a NSC called fructan (from late cut hay or overgrazed paddocks) or horse feed with high levels of starch is not absorbed in the small intestine and NSCs can rush through to the hindgut in large quantities. The microbes digest these, but too many VFAs are formed too fast. This causes the pH level to drop, which kills the good bacteria in the gut and can result in laminitis, amongst other things. This is why, a diet containing NSCs appropriate to your horse’s energy requirements is needed. A racehorse in full work will tolerate a far higher level of NSCs than a resting horse, because the VFAs are used for energy. NSCs are also easily absorbed and can cause a ‘sugar rush’ which can result in your horse being ‘hot’ and unfocussed. To manage this problem, feed a diet low in starch, feed a good quality hay and manage overgrazing by rotating paddocks. Protein is essential for healthy muscle development. Amino acids are the building blocks of muscle and, if they are absent, muscle development comes to a complete stop. Essential amino acids are those that the horse’s body cannot manufacture – they must be supplied in the diet. They are: arginine, histidine, isoleucine, leucine, lysine, methionine, phenylalanine, threonine, tryptophan, and valine. Of these, lysine, methionine and threonine are known as ‘limiting’ amino acids. This means they are the most likely to run out during protein synthesis for muscle development. Insufficient muscle development will compromise the horse and possibly cause unsoundness. So it is essential that the horse gets sufficient good quality protein in his diet. Calcium and phosphorous must be present in the diet in the correct ratio. There must be at least as much calcium as phosphorous and preferably more (ratio 1:1 to 2:1). If there is more phosphorous than calcium, your horse’s body will start to leech calcium from his bones, causing huge potential soundness issues. Check your horse food label, especially if you are mixing grains yourself – if this ratio is incorrect, you might need to feed a calcium supplement. Another thing to consider here is Vitamin D. Even if you are feeding the perfect amount of calcium and phosphorous, none of it can be absorbed without Vitamin D. This is why a lack of Vitamin D has been linked to bone deformities. Zinc, iron and copper are another example of minerals that are linked, because they use similar transport mechanisms. Iron, although a common ingredient in supplements, is almost never lacking in horses. It is present in most things your horse consumes – feed, grass, hay, even water. And too much iron can block the absorption of zinc, so supplementation of iron, except in specific cases where the horse is suffering from anaemia, is not recommended. Similarly, zinc can cause a shortage of copper. A rough ratio of copper to zinc in your horse’s diet should be 1:3. This will correct the effect of zinc on copper absorption. Hoof quality is intrinsically linked to methionine (an amino acid), biotin (a vitamin), copper and zinc. 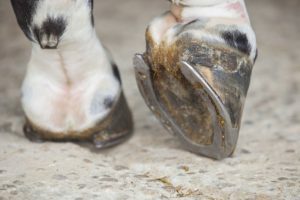 Horse feeds seldom provide sufficient of these in the correct ratios so in a horse with any hoof problems at all (brittleness, losing shoes, sensitivity, cracks, poor growth), supplementation is recommended. A joint supplement, at any age but even more so in ageing horses, is recommended. Joints have a layer of cartilage between the ends of the two bones. This can become worn down over time and cause pain. Supplementing with MSM, Vitamin C, turmeric and glucosamine (or hyaluronic acid injectable) helps to keep the joint in good condition and keep lameness at bay. Omega oil supplements will help to keep inflammation at bay – in arthritis, during recovery after exercise and in horses who ‘tie up’. There are two types of omega oils – omega 6 and omega 3. Generally speaking, omega 6 oils are pro-inflammatory and omega 3 oils are anti-inflammatory. But omega 6 oils are still necessary – inflammation plays a role in healing. So again, a delicate balance is required with more omega 3s than 6s desirable. An exact ratio is still under review. Omegas can be easily added to your horse’s diet by feeding canola oil, fish oil, flax seed oil or chia seeds. Antioxidants, because of their sensitive nature, are often deficient in feed. And they are extremely valuable in preventing damage to tissues such as muscle, ligaments and tendons by scavenging ‘free radicals’. Free radicals are molecules produced by oxidation that damage tissues and cause ageing. Examples of antioxidants are: Vitamin C, Vitamin E, selenium, zinc. Gut health can benefit from supplementation of prebiotics and probiotics. Probiotics are live cultures of beneficial bacteria. It needs to be a live strain and one that colonises the equine gut. Probiotics that are spores are useful as these are stable and don’t need to be refrigerated. Prebiotics are molecules that the good bacteria in the gut use as food. There is a school of thought that it is better to supplement with a prebiotic (that increases the population of the good bacteria in your particular horse’s gut) than with a probiotic (that is foreign to your horse’s gut). Examples of prebiotics are fructo-oligosaccharides and xylitol. Lastly, a content horse is a safe horse. Horses who are stressed are likely to damage themselves. Besides the obvious contributors to stress (inadequate turnout, unkind training methods, no companions, etc. ), feeding can also be a factor. Horses deficient in certain nutrients – magnesium, vitamin B1, tryptophan or 5-hydroxytryptophan – also suffer from stress. Supplementation can address these deficiencies.